Adam has a BA in Environmental Science from Columbia University and an MPhil in Geography from the University of Oxford. During his MPhil he interned at Microsoft Research, Cambridge and afterward was a research assistant at the University of East Anglia. His DPhil is with the Complex Human-Environmental Systems (CoHESyS) lab. Deforestation is contributing to climate change, habitat destruction, and the loss of forest resources. However, new data and algorithms make us better equipped than ever to address it. 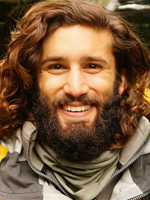 Adam's work applies computational methods to assess research and strategies for reducing deforestation. He is using natural language processing on large volumes of deforestation news and literature to find research gaps. He is also building agent-based simulations of agricultural production systems to identify strategies to maximize yields and minimize cropland expansion into forests. He has an interest in how machine learning can extract insights from satellite, drone, and sensor data to inform agricultural simulation. Formica, A., Burnside, R.J. and Dolman, P.M. (2017) Rainfall validates MODIS-derived NDVI as an index of spatio-temporal variation in green biomass across non-montane semi-arid and arid Central Asia. Journal of Arid Environments, 142: 11-21. Formica, A. Farrer, E.C., Ashton, I.W. and Suding, K.N. (2014) Shrub Expansion Over the Past 62 Years in Rocky Mountain Alpine Tundra: Possible Causes and Consequences. Arctic, Antarctic, and Alpine Research, 46(3).